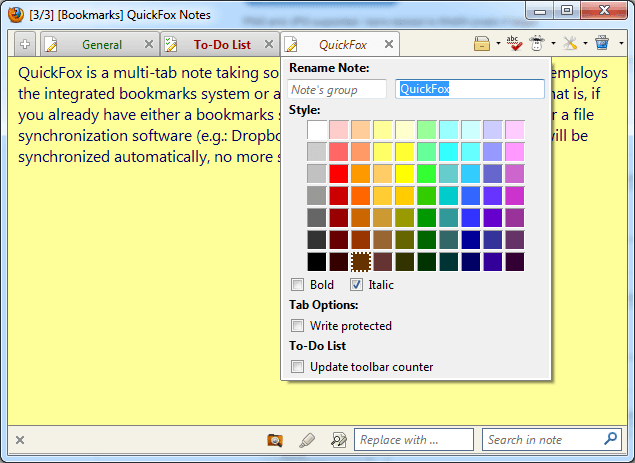 "QuickFox" is a multi-tab note taking add-on for Firefox that uses the integrated bookmarks system or a single sqlite database to store notes. Therefore, if you already have either a bookmarks synchronization add-on (e.g: XMarks) or a file synchronization software (e.g: Dropbox, SugarSync, Syncplicity), your notes will be synchronized automatically. Where does QuickFox store your notes? By default, QuickFox uses Firefox bookmarks to store note data. On first start, a folder called "QuickFox" will be created in your bookmarks. Each bookmark on this folder represents a separate note. Hence, each bookmark is named according to the label of the note it represents. The actual text of the note is stored in the description field of the bookmark. That means you can access note data through a bookmark's properties, even if the add-on is not installed in Firefox. For example, if you are using Xmarks, you can access your bookmarks from any internet cafe via web interface. If you want to view your notes you created at home, just login to your Xmarks account and view the description field of the bookmarks from your QuickFox folder. Is it possible to open QuickFox as a standalone application (Like MS Notepad, ...)? Is it possible to add QuickFox to the windows-context-menu? Depend on your windows version download one of these files (32 bit or 64 bit). Double click on it and you will find a new item ("Import to QuickFox") is added to your windows context menu. Note: You need to edit these files with a text editor if Firefox is not installed in its default path. What is the "Archive" feature? How does the search tool work in QuickFox? Press "Ctrl+F" to change focus to the search-box, then type desire string. Press "Enter" key to search next matched word. Press "Esc" key to clear up the field. Use "Tab" key to change focus back to the editor. What are the mouse pad options available on QuickFox? Is it possible to open QuickFox via a keyboard shortcut? Yes, try Ctrl+Shift+F; It is even possible to change this shortcut: In your address bar, type "about:config" and hit "Enter" key. Search for (1) "QuickFoxNotes.modifier" and (2) "QuickFoxNotes.key". Double-click (1) to change the value for the modifier key (Ctrl, Shift, Alt or a combination of these). Double-click (2) to change the accelerator key ("F" is default). Firefox needs to be restarted for the changes to take effect. What can I do to restore my notes in case of an error that involves data loss? Is it possible to rename notes? Right click on title section of a note to access to the rename panel. Is it possible to change the default font family? In the address bar, type "about:config" and hit "Enter" key. Search for "QuickFoxNotes.FontFamily". Place the name of a fontfamily there (e.g. : Arial, Courier). Note that QuickFox needs to be restarted for the changes to take effect. What is the Google word suggestion and calculator feature? Let's assume we are trying to write down "Firefox bookmarks addon" in the editor. To do so, just type a portion of the first word ("Fire" in this example) and hit F1 (F1 will search Google for only one word before cursor's position; "Fox" in our example). Results will be shown as a notification box (Only if any suggestion has been found). Press 1-9 keys to select one of the suggestions; to ignore them press "Esc" key. Now assume that we have "Firefox boo" in the editor. This time press F2 which searchs Google for two last words before the cursor's position ("Firefox boo" in this example) (Note that by pressing F1 only last word will be considered which will lead to inappropriate suggestions!). F3 and F4 work similarly but based on three and four words, respectively. You can force the calculator to try to evaluate an expression by putting an equals sign (=) after it. Check this site for more information on how to work with Google calculator. What is the "Group" feature? Is it possible to use monospaced fonts for editor? Monospaced font, is a font whose letters and characters occupy the same amount of horizontal space. QuickFox can support this type of fonts as far as the font has been already installed in your system. First select a monospaced font from this list then check the availability and then follow up FAQ #10. What are the steps to migrate the repository type from "Bookmarks" to "Local Storage"? 1.If keeping existing notes is concerned, go to Tools>Options>Change Repository>Switch and Keep existing notes. Please note that, QuickFox will NOT make any change to the current repository, it would be possible to switch back to the current repository at any rate. 2. In case that more than one repository is of interest, go to Tools>Options>Change Repository>Select hard disk folder and switch to it. In this case, you will be switched to a new repository (Clean one if you don't have QuickFox.sqlite file inside the folder, otherwise, QuickFox will append the database file) and your current repository is intact. You can switch back to the current repository at any time. Is it possible to have more than one repository? Yes, QuickFox is capable to use a single sqlite database as well as a bookmark folder as its primery repository. Consider that during the switch process to a new repository (Tools>Options>Change Repository) your current repository is intact, so your data is safe and you can switch back to current repository at any rate. > To have more than one "Local Storage" repository, create a new folder in a location that QuickFox is permitted to read and write, then try Tools>Options>Change Repository>Select hard disk folder to point QuickFox to this folder. > To have more than one "Bookmarks" repository, Try Tools>Options>Change Repository>Change default "Bookmarks" folder. To return back to original repository change "Bookmarks folder" to "QuickFox" and switch to it.